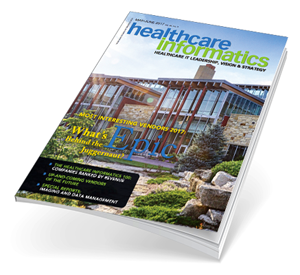 Each year, Healthcare Informatics profiles six fast-growing companies that could very well make “The 100” list of the largest U.S. health IT companies in the future. Audacious Inquiry is honored to be recognized as one of their “Up-and-Comers”! Each year, to accompany our Healthcare Informatics 100 list of the largest companies in U.S. health information technology, we profile six fast-growing companies that could very well make The 100 in the future. The growth trajectory of these startups suggests they could have a significant impact in health information technology. Most have drawn strong interest from venture capitalists. Others are coming at seemingly intractable problems in healthcare from completely new angles. The first such company on this year’s list is Baltimore-based Audacious Inquiry. Maryland’s Chesapeake Regional Information System for our Patients (CRISP) is widely considered one of the most successful statewide health information exchanges (HIEs) in the country. Perhaps less well known is the technology partner behind CRISP. Baltimore-based Audacious Inquiry LLC (Ai) has grown from a one-man consulting firm founded by Chris Brandt in 2004 to a 100-person technology integration and services company serving HIEs and other organizations across the country, including the U.S. Department of Health & Human Services (HHS). In the beginning Brandt was a solo consultant working for Erickson Senior Care in Maryland. It had an embedded primary care practice and Brandt saw the difficulties it had exchanging data about patients. To tackle this problem, Erickson began working on an early HIE in 2006, which later provided the foundational knowledge for what became CRISP. Along with partner Scott Afzal, Brandt was involved in grant applications as well as selecting and implementing the technology that became CRISP. Starting with CRISP, Ai developed and implemented a proprietary encounter notification service (ENS) that sends secure hospital admit, discharge, and transfer notifications in near real-time. Ai bought the ENS intellectual property back from CRISP and commercialized it first with the HIE in Delaware, and subsequently with HIEs in several other states, including Florida and Utah. Ai also has found customers for the ENS service outside the HIE landscape, among hospitals and health systems and payer organizations — anywhere there are strong incentives to facilitate connected care, Brandt says. The company has developed some quality metrics tools. Its CAliPR (CQM Aligned Population Reporting) tool was designed with an eye on the needs of Medicaid providers to record their clinical quality metrics (CQMs) and report them up to the state level. In another example of the type of work Ai does, in 2016 the California Emergency Medical Service Authority gave it a contract to develop a standards-based solution to support real-time queries across health information exchange and provider organizations for individuals’ health information during a disaster. Ai is developing the Patient Unified Lookup System for Emergencies (PULSE) as the technology platform to be leveraged during disasters. Located in a research park at the University of Maryland Baltimore Campus, Ai takes advantage of its location, Brandt says. “There is a highly educated work force in the region, as well as a concentration of healthcare experts and organizations,” such as Johns Hopkins and the federal Center for Medicare and Medicaid Services (CMS). It has done work for the Office of the National Coordinator for Health IT. Brandt said Ai helped create the Office of the National Coordinator for Health IT’s (ONC) testing environment to validate EHR vendors sending documents in standardized formats. Editor’s note: Genevieve Morris, previously a health IT senior director at Audacious Inquiry, was recently tapped by ONC the as principal deputy national coordinator for health IT.